After fast and furious consumer protest and the petition that Paul Gallagher started raising over 2500 signatures in under two days, it appears American Airlines has seen the light of day and will not give vile anti-vaccine lies a platform in the in-flight "infotainment". Thank you American Airlines - thank you all who wrote, tweeted and signed! The CDC reported a couple of days ago, that 90% of the US' 2011 record 222 measles cases were associated with imports from other countries, nearly 90% of patients were unvaccinated or with unknown vaccination status; and of those eligible to have received the vaccine, a whopping 76% had a non-medical exemption. These numbers stress the significant risk of vaccine refusal. Measles imports into the United States come at substantial medical risk and cost, about $10000 per measles case and over $700 in income loss and other costs per quarantined family. Recent outbreaks in California, Utah, Minnesota and Arizona have cost the health system/hospitals between $130000 and $800000 to contain. Less than a year ago, an unvaccinated infant, returning from India, exposed passengers of American Airlines flight AA3965 from Chigaco to Des Moines to measles. As a consequence of this measles import, 100 persons had to be contacted about their exposure, 25 had to be quarantined. American Airlines seem to have a very short memory. Apparently, they are planning to feature the notorious Australian anti-vaccine campaigner Meryl Dorey of The Australian Vaccination Network (AVN), via it's in-flight "Executive Report" media and "American Way" magazine, from July to August 2012. The interview (transcript) is clearly intended to discourage parents from vaccinating, which we know will lead to resurgence of deadly diseases, like measles and pertussis. I am not sure that disease is what American Airlines means to "give back to our communities". You don't think deadly disease should be encouraged by advertising? There is a petition - sign it! ETA (24/04/2012): see fab update! Mom thinks her daughter has measles, she wants to take her daughter to see her (vaccine friendly negligent) doctor in the morning. Instead of debating quarantine, a discussion about oatmeal/baking soda baths ensues. So, what is likely to happen? There are no reports of measles in Kentucky at the moment (yes, I asked). 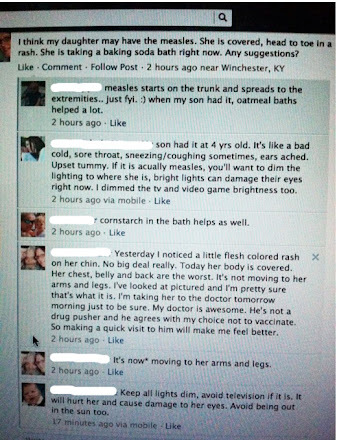 Most likely and the best case scenario, the OP's daughter has some other viral rash and will not have measles at all. She'll recover, mum and friends will retain their "measles are not a big deal if you just do the right thing" (oatmeal/baking soda baths, it appears) smugness. Hopefully, mum will sober up and call the practise with her suspicion before going there. There is a reason that there are elaborate regulations to prevent measles transmission in a medical setting. If this turns out to be measles and mum did indeed take her daughter to a doctor's practise this morning, I predict we are going to see more cases, like for example here, here and here. The worst case scenario is that an infant will be infected in the waiting room (more likely in practices tolerant of non-vaccinating families), and ultimately dies, like we have previously described. I went on to write about how Sears’s downplaying of vaccine-preventable diseases was particularly ironic given what occurred in San Diego in 2008, when “a seven-year-old boy who was later revealed to be one of Sears’s patients returned from a family vacation in Switzerland with the measles.” Eventually, 11 other children were infected and dozens more were quarantined (some for up to three weeks); it ended up being the largest outbreak in California in almost two decades and cost well over $100,000 to contain. Sears’s involvement with patient zero was not some sort of secret: It was also reported in a December 19, 2008 episode of This American Life, in the middle of an interview with Sears himself. (You can hear that part of the broadcast—”That’s Dr. Bob Sears. 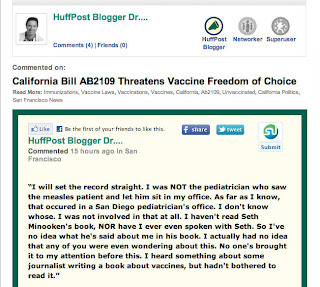 … Dr. Bob, as people call him, is also the doctor for the non-vaccinating family that went to Switzerland”—here. For people interested in the whole show, Sears comes in just before the the 34-minute mark.) It was also reported in Sears’s hometown newspaper, The Orange County Register. Of course I remember the show, and her comment. BUT, she wasn't accusing me of being the pediatrician that the measles patient went to see when he had measles and sat in his waiting room. She simply stated that that child was my patient (which is correct, but they didn't come to see me during the measles illness). She was baiting me, and suggesting that the fact that that family had decided against the MMR vaccine long before they ever became my patients was MY fault. I wasn't about to give her the satisfaction of acknowleding her comment. What I was referring to by the statement "I had no idea" was that I never knew anyone, much less a supposedly respected reporter, was spreading the FALSE rumors that I was the pediatrician involved in the outbreak. I have simply been the family's pediatrican over the years, but I practice far away from them, so they went to a local ped for THIS problem. Anyone who has written or suggested otherwise printing false information. PLUS, I WOULD LIKE TO THANK YOU, AND SOME OF THE OTHER NEGATIVE COMMENTORS TO MY BLOG, FOR HELPING TO PROVE MY POINT. It seems that when a doctor's patient chooses not to vaccinate, then catches one of the diseases, IT BECOMES THE DOCTOR'S FAULT? SO, WHY WOULD DOCTORS TAKE FURTHER RESPONSIBILITY AND LIABILITY FOR THEIR PATIENTS' DECISION AND SIGN THEIR NAME TO THE EXEMPTION FORM? That's my point; I appreciate you furthering my cause against AB2109. When I explained that I was not actually interested in advertising on Sears’s website but wanted to interview him, I was assured that Sears would be in touch in short order. After not hearing back for two more weeks, I emailed again; still, nothing. Finally, on July 14, Sears wrote to me, claiming that he’d emailed me previously but never heard back. (Perhaps he’d been emailing Seth Minooken.) We arranged a time to speak, but he didn’t answer his phone. We arranged a second time to talk, and finally, on July 21, 2009, we conducted our first interview; over the coming months, we spoke one more time and had several email exchanges. Finally, it seems worth noting that during the entire time I was working on The Panic Virus, never once did a representative from a pharmaceutical company or a government official even obliquely discuss any type of financial arrangement. In fact, there were only two people who did: One of Sears’s office minions and the man Sears is embracing in the picture below: Andrew Wakefield. That said, Liz Ditz pointed me to a local article that ran regarding the 2008 measles index case along with her report of it. 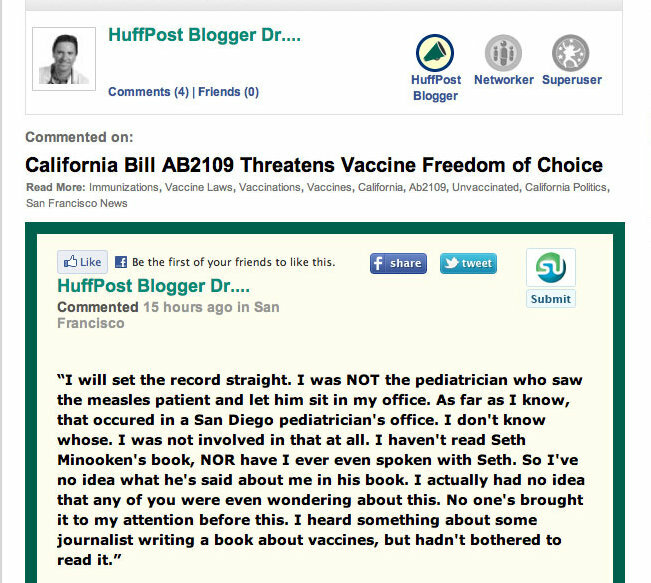 Dr. Bob is not directly responsible for the 2008 measles outbreak that I had previously reported.